Home › Abundant Living › Modern Fatherhood – Good or Great? Modern Fatherhood – Good or Great? On the heels of a Father’s Day weekend, it struck me that the bar for acceptable fatherhood is fairly low. The world pats us on the back for essentially showing up. From a Biblical perspective the standards are raised substantially. It’s actually easy to be a “good father” in the eyes of our modern social culture. In truth, there’s almost no excuse for not being a Good Dad. Be a nice guy, help out with the dishes, change a few diapers, take the kids to the park, take them to soccer practice, coach a team (bonus points), take them out for ice cream, help mom with some house chores, go on hiking trips, Dads & Kids campouts, read and tell them stories at night, help with homework, even help out at bath time. Yes, indeed, there are lots of ways to score points as a Dad. Unfortunately, it’s easy to convince ourselves, and the culture assures us, that these Good-Dad Deeds are sufficient for raising good children and earning us men kudos as sensitive, modern fathers. But there’s more to fathering than this. From a Biblical perspective, there’s been an insidious softening of standards that have gotten lost in the modern world. 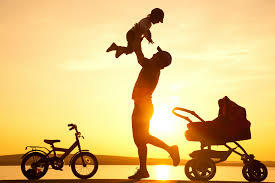 Fortunately, while involving a life-redirect, it’s not that complicated to be a Great Dad based on different standards. The first 20 years of fathering my 3 children was done intuitively. Oh yes, I had read the books, gone to church parenting classes, heard sermons and gone to camps. But I took in most of the information as suggested guidance, common sense, and helpful tools. These certainly helped and provided good instruction. However, looking back I see now that I was merely going through all the good motions. I was a Good Dad. I was not as deliberate in my fathering as I would be today. In fact, I would be extremely different if I had the chance to do it all again. My grandchildren today are the beneficiaries of my new fatherhood mentality and approach. While my grown children are all quite healthy and capable, I didn’t do what I would recommend other Dads do today. My children might object today – “Dad, you were great” – but I believe they will admit that the Dad they know today is certainly more deliberate than the Dad they grew up with when it comes to my Christian faith, full integrity of my walk and full surrendering of my life to Christ. 1. Love the Lord God with all your Heart, Soul and Mind (Matthew 22:37) – If you love God with all that you are – full surrender, all in – you will know Him, experience Him and absorb His Word. That will translate to how you treat and teach your children. You will be a great father. Can’t miss. The Good-Dad Deeds will be supplemented by a purposeful life of substance, depth and godly wisdom. 2. Love Your Neighbor as Yourself (Matthew 22:39) – If you love your fellow man and treat them with godly unconditional love, you will have the right balance, perspective, mindset and life-fruit. That will translate into a well-modeling father that will benefit your entire family. 3. Teach Your Children to do Steps #1 and #2 – That means raise your children to know God and love God with all their heart, soul and mind, and then love their fellow man. How? Live the model yourself. Even in humble stumbling, you teach your children the ways of the Lord. The yield will be bountiful. For more, see also past post Wise Fathering or the category Fathering. I watched my son-in-law and daughter teach Biblical obedience to their 2-year old, our granddaughter, by teaching her to recite a Bible verse. Simply: Children obey your parents, in everything, for this pleases the Lord. (Colossians 3:20) Their little girl made the connection when she did something wrong and was reminded of the verse. Our granddaughter stopped in her tracks, you could see the wheels turning, she apologized and received a loving hug. Without a doubt that young innocent child will grow to be a follower of Jesus and know the teachings of the Lord. It permeates the household. There is nothing heavy-handed going on here. Only good teaching – Biblical teaching as we were created to know, understand and follow in obedience. And just as it’s never too late for fathers, it’s never too late for children too. Do you want to be a good father or a great father?